Head of Practical Tai Chi Chuan International, Dan Docherty. Principal Instructor (level 9) of Practical Tai Chi Chuan Scotland, Charles Gorrie. Instructors, Ketron Miller, Nicola Burns, Laura Roberts. Bishopton Community Centre, Poplar Crescent, Bishopton, PA7 5AF. St Ninians Church, Albert Drive, Pollokshields (beside the Tramway venue). Orchardhill Parish Church, Church Road, Giffnock. 9.30-11am £8 per class with coffee afterwards. 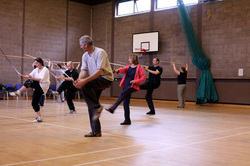 ​ Tai Chi & Qigong Free class, only available to NHS staff. St Ninians Church (Tuesday or Thursday) and Mosspark United Church, Monday. One class per week per calendar month, £28.00. Two classes per week per calendar month £50.00. Payments can be made at the start each of month by standing order or at first class of month. BCMA members £10.00/£7.00, non members £12.00/£9.00. BCCMA insurance membership £20 per year. Available to Healthy n' Happy clients only.